If you follow Hunt & Gather Home on Instagram, you know that I post a lot of historic preservation related photos. Preservation is one half of what Hunt & Gather Home is all about, and designing inspired and livable spaces within those restored walls is the other. While I love working on and in historic structures, having an older home is certainly not a requirement for a design project. 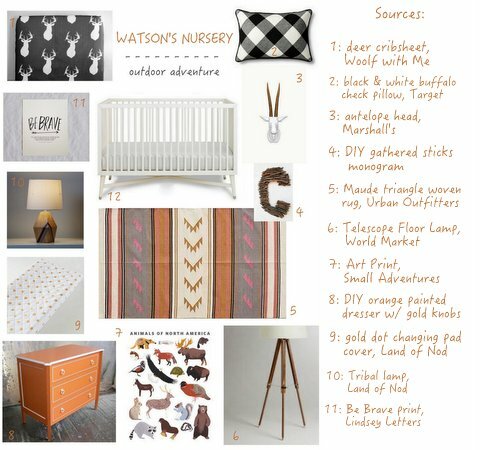 Case in point: Watson’s nursery. My dear friend, Christina, recently asked me to help her gather ideas for a nursery for her third child, and first little boy, Watson. Christina and her husband are currently renting with plans to buy soon. Not knowing what size room Watson will have when he arrives, Christina let me run free with the design. She gave me only one thing to go on: she loves the crib sheets and changing pad covers from Woolf with Me. Knowing Christina and her husband well, one pattern jumped out among hundreds of designs. I knew the deer crib sheets would be a hit with her husband, a hunter, while Christina would approve of the cute design and gray color. To complement the modern hunting theme of the crib sheet and bring in a pop of color, I chose the gold arrow changing pad cover. 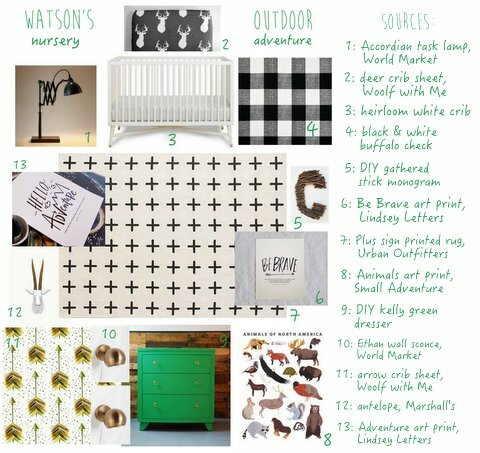 You’ll find those basic pieces in each of the three design boards I created for Watson’s nursery. Since Christina has two older (and precious) girls, an heirloom crib, a comfy glider, and a chest-of-drawers will need a few updates to get them ready for little brother. The crib will remain white, a nice contrast against the gray crib sheet. With the addition of a black and white buffalo check throw pillow the glider will be ready for late-night rocking. A quick coat of paint will transform the currently pink chest-of-drawers into a boy-friendly focal point in the room. Because Christina already had the three main pieces of furniture for the nursery, I decided to have fun with the rugs and chest-of-drawers and make them the statement pieces in the room. Black, white, and gold can be used interchangeably in all three designs. All Christina needs to do is decide if she prefers orange or green accents! 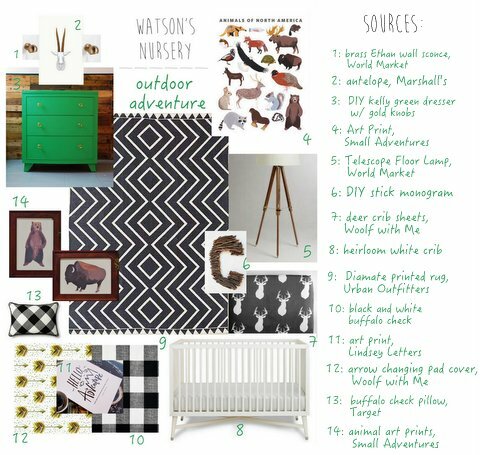 As Christina, her husband and kids prepare to welcome Watson into their family, my hope is that these design boards will to guide them into creating a special space for a little boy who is sure to love all things outdoors.